Federal, State and International Criminal Defense - Robert N. Pelier, P.A. Our firm provides aggressive, experienced representation for those accused of a crime. I have never forgotten those words and realize that the true administration of justice is ensuring that every person accused of a crime by the government receives zealous, competent legal representation. The Constitution of our great Country affords us certain rights. We have the right to remain silent. We have the right to have a lawyer represent us in a criminal proceeding. We have a right to confront our accusers and witnesses and we have a right to due process and a fair trial. The criminal process is complicated whether it be related to an investigation of criminal activity by law enforcement or once you or a loved one is arrested. Securing legal representation at the earliest possible moment is crucial and may make the difference between a conviction and an acquittal. It is important that you do not go at it alone in dealing with the criminal process. I can provide you with aggressive, knowledgeable representation at these moments of difficulty. I’m sensitive to the importance of presenting favorable information about the accused as early on as possible in the process. Thorough preparation, tenacious, experienced representation maximizes the possibility of obtaining the best results during an investigative process, bond hearing or at trial. My staff as well as I, believe in comprehensive access and communication between the client, witnesses and all others involved in the process in order to fully develop the facts and defenses in the case. Whether it be a Federal or State law matter, I’ve tried cases to verdict in and outside the State of Florida. I’m also licensed in the State of New York and have handled cases of all types of issues and complexity. My experience and preparation matters mostly in Court. We recognize that being subject to criminal, proceeding is incredibly stressful and life changing. Our office is there with you every step of the way to guide and represent you during this challenge and controversy. 4649 Ponce De Leon Blvd. 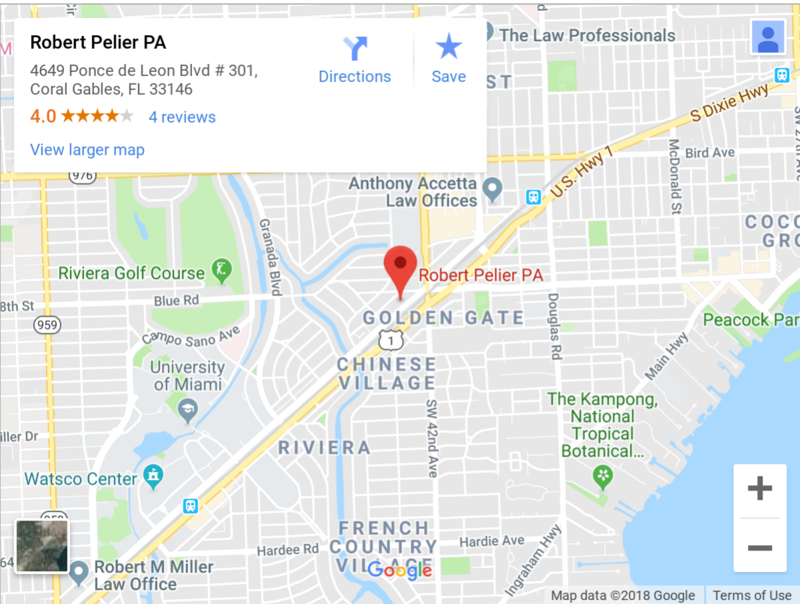 The law office of Robert N. Pelier P. A. is a full service trial law firm. We handle civil and criminal matters. Our experience and aggressive representation helps our clients where it matters most: IN COURT. Our commitment to success in the pursuit of justice includes responsiveness and immediacy required to serve our clients and their legal needs. Please be aware that by contacting us you are not establishing an attorney-client relationship with anyone at this firm. Please do not send any confidential information to us until such time as an attorney-client relationship has been established. © Law Offices of Robert N. Pelier, P.A.